College admissions officers will tell you your test scores are only one factor they use in considering your application. In this order, you will be told they will consider the difficulty of your courses, your grade point average, your extracurricular activities, and your recommendations. Many times ACT and SAT scores are the ultimate and compelling factor in admission to the most competitive colleges and universities. Thousands of students from thousands of schools must be compared; though each has significantly different courses and grading systems. The ultimate "meaningful" yardstick? How competitive is the school you are applying to, and, ultimately, what were your highest ACT and SAT results? "One of your tutors, (tutor), tutored my oldest son, (student), last summer and helped him to achieve significant gains on the math section of the SAT. (Student) got on the wait list at several colleges, including Wake Forest, Boston College, and UNC, but luckily, he was accepted to his first choice, which was NC State." There's no need to stress about how you will perform on this important test if you're properly prepared beforehand. Individualized in-home test prep from BrainTrust is an ideal way to prepare for the ACT and SAT so you can approach the tests calmly and confidently. We can focus on the subjects you find troublesome, and increase your score on your best topics. While you can take the ACT and SAT as many times as you'd like, ideally you'll do so well the first time you won't require second and third attempts. But if you have already taken a test once or twice, we can help you increase your score on your second or third try. Even straight "A" students of two highly educated parents often are surprised when they fail to score as highly as might be expected on the ACT and SAT reading sections. Why? Your child's education has likely never been targeted to enhance specialized reading skills. While the ACT and SAT emphasize short and very dense passages, very few high school teachers do so. The right answer often centers around the forceful use of a single word. Students are often surprised to find that ACT and SAT questions fuse the subjects of algebra, geometry and statistics. A good understanding of linear equations, problem-solving and graphs is required to score well on these standardized tests. 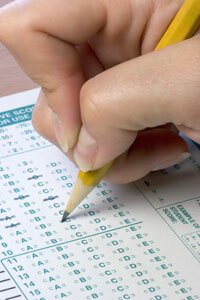 Our personalized in-home test prep programs can help your student do his or her best on these important tests. Contact BrainTrust today to discover how our unique approach can help maximize your child's test scores.